At Bashioum Cosmetic Surgery Center we proudly provide cutting-edge cosmetic surgery, including liposuction. Our skilled surgeon specializes in a variety of advanced and effective cosmetic surgeries, ranging from breast, to body, to face procedures. We offer individualized treatment to fit the unique needs of each patient coming to our office to ensure that they receive the safest, most effective treatment possible. Dr. Bashioum and our team understand that you may have many questions before undergoing liposuction treatment. That’s why we take the time to make sure each of our patients is well informed before entering the operating room. Check out some answers below to frequently asked questions we hear about our Minneapolis Liposuction treatment. What can I do about bulges on my thighs or torso? Will I ever be exactly the same on both sides? Will this problem return if I have children? I have heard about so many bad things on television, is it safe to have liposuction? What can you tell me about this new technique I saw on television? How old do I have to be to have this surgery? What additional procedures can I consider that will enhance the result? How many times can I have liposuction done? How long will I be in the operating room? 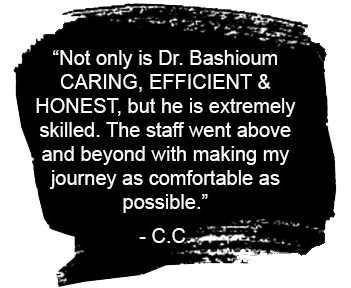 I want you to be as informed as possible before you choose to have surgery at the Bashioum Cosmetic Surgery Center, Ltd. Patients frequently ask the same questions about each surgery. I have compiled this list of questions from my 25 years of cosmetic surgery experience. I hope these help you understand how cosmetic surgery is beneficial and how it can make you feel better about yourself. Liposuction (AKA lipo-sculpture, body sculpting, or fat removal) reduces isolated fat collections, enhancing a person’s figure and physique. Fat is carefully removed from these selected areas. Women and men turn to liposuction to aesthetically balance their figure. Please call our office for an accurate price quote or, better still, come in for a personal consultation. Liposuction fees are based on the number of areas treated and the difficulty of the surgery. Our suggested quotes include professional fees, anesthesia fees, operating room costs, equipment fees, and before and after care. They do not include hospitalization costs, prescriptions, home nursing care, preoperative history and physical examination, laboratory costs, or pathology fees. If you compare prices, make sure that you consider all these costs and fees. Also, liposuction does require some time off work for a safe recovery. Some people have fat collections in certain areas of their bodies. Men typically have bulging in their abdomen and flanks while women typically have collections in the lateral thighs and flanks. Liposuction selectively reduces these deposits through small, inconspicuous scars. Tumescent liposuction is a technique in which large amounts of medicated fluid (saline mixed with epinephrine and lidocaine) is injected into the fat to be removed. This makes fat removal easier and it reduces blood loss during the operation, allowing us to remove more fat safely. It is normal for the body not to be the same on both sides. Liposuction can reduce these differences but not eliminate them completely. It will be necessary for you to adjust to some asymmetry after your surgery. Liposuction requires strategically placed small (one-eighth to three-eighths of an inch) scars. The combination of areas that are treated will determine the number and actual placement of scars. These are inconspicuous and easily covered with clothing and/or makeup. It is important to understand where liposuction scars will be placed. Almost every area of the body can be treated with liposuction. The most commonly treated areas are the thighs, hips, abdomen, and the neck. The maximum amount of aspirate (total fat and fluid) that can be removed safely at one time is about four to five quarts. We will determine how much fat to remove at the time of surgery. This depends on how many areas are treated, the elasticity of the skin, and the thickness of fat beneath your skin. You can estimate that for every quart of aspirate that is removed about one pound of fat is removed. If the maximum safe amount (five quarts) of aspirate (total fat and fluid) is removed, you can expect to see about a five-pound weight loss. Usually less fat is removed. Do not expect to appreciate this weight loss until three to six weeks after liposuction due to the normal water retention after surgery. Remember, liposuction is not a treatment for obesity. You should not focus on weight loss. You should focus on sculptural changes in your figure and body shape. Skin irregularities of the thighs and/or buttocks known as cellulite are difficult to correct. It is made worse if there is skin sagging. Thigh lift surgery may be the best choice to help correct cellulite if the cause is due to skin sagging. Unfortunately, it is impossible to predict if this problem will return after having children. Natural changes in body shape do occur as a result of pregnancy. There are risks with any surgery. Infection, excessive bleeding, abnormal scarring, poor healing, slow healing, skin loss, changes in skin sensation, and muscle or nerve injury, although uncommon, can occur. Fortunately, most problems that result from such complications are correctable with additional surgery. Although very rare, there have been reported deaths as a result of blood clots in the legs, severe infections, pneumonia-like conditions, and excessive fat removal. You must understand your risk of complications completely before you choose to have liposuction. There are always risks to having cosmetic surgery. Serious problems are usually related to excessive surgery and/or undiagnosed medical conditions. We believe liposuction can be done safely with a high degree of patient satisfaction. What can you tell me about this new technique that I saw on television? Everyone in the United States wants the latest in medical care. Unfortunately, this is not always the best medical care. At times, media presentations will leave out critical information about potential complications, quality of results, and FDA regulations. We are open-minded when it comes to new technology but prefer not expose our patients to the newest techniques until they have been proven to be effective and safe. Body development can continue into the early twenties. When liposuction is done before this time, there is a chance the surgery will have to be repeated. In addition, it may be emotionally difficult to adjust to the surgery during teen years. For these reasons, we suggest that liposuction be postponed until eighteen years of age. For general health reasons, we recommend that all our patients stop smoking. It is clear that smoking increases your risk for developing all sorts of cancers. Breathing problems like emphysema and circulatory problems, including heart attacks, are also linked to smoking. Smoking can increase the risk of coughing after your surgery, which may lead to unwanted bleeding. Finally, the chemicals released from burning tobacco also reduce blood flow, which can result in skin loss during the healing period. It is always best to stop smoking. There are other choices when it comes to liposuction. These include skin and fat excision, weight loss, acceptance of a deformity, and changes in clothing styles. Alternate liposuction techniques include ultrasonic liposuction and laser liposuction. We believe that they have no advantages over tumescent liposuction. Always understand all your options before having liposuction. Surgeries can be combined to yield dramatic and complimentary results. For safety reasons, our practice recommends the length of surgery be limited to six hours. When combined with other surgery, we suggest no more than one area of the body be treated at the same time. When liposuction is done alone, multiple areas can be treated, provided no more than four to five quarts are removed. This is a question that can only be answered after a personal consultation. Liposuction is suggested to patients with localized fat collections and good skin elasticity. We feel strongly that liposuction is not a treatment for obesity. Obesity increases the risk of complications and detracts from the aesthetic result. There are many other things to consider, including psychiatric conditions, life stress, medical illness, obesity, and motivation. You should be a healthy nonsmoker within twenty pounds of your ideal weight, not going through major life stress (i.e. grieving a death, changing jobs, divorcing), and motivated by internal desires to look better. Each time surgery is done, scar tissue is created in the surgical site. This scar tissue detracts from the natural result and makes fat removal more difficult. For these reasons, we recommend that liposuction not be done more than two or three times in any one site. If you do not gain weight, the changes should be very long lasting. This is not a treatment for weight gain or obesity. Liposuction in our office is usually completed under general anesthesia. Patients are completely asleep and comfortable during the surgery and remember little or nothing of the experience. Liposuction can be separated into four parts. First, a plan is outlined on your areas of concern. Second, small incisions are made near the areas to be treated. Next, the fat is removed using a slender instrument. Finally, absorbable stitches are placed to close the incision in the skin. Surgery takes about one to four hours to complete, depending on the number of areas to be treated. You will spend about four to six hours in our office. We hope that we were able to answer your questions regarding your liposuction surgery. If you have further questions, or want to inquire about our other high quality breast, face, and body cosmetic surgery services, give us a call today. To schedule an appointment, contact us or fill out our easy online consultation request form on the right side of your screen. We look forward to hearing from you soon!